Settled concrete sidewalks are slab jacked, by coring strategically placed injection holes along the section of sidewalk. Grout injection is carried out at each location, allowing the sidewalk to be uniformly lifted back to specified grade. 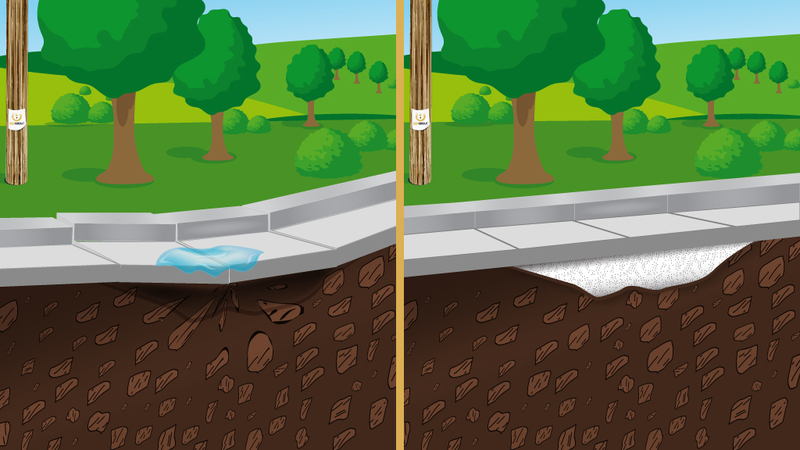 This method of slab jacking works well for both separate and monolithic sidewalks, by varying the injection hole pattern. During the lifting process, the grout flow properties allow for filling of all the available void area beneath the slab. Upon completion, all core holes are filled with a high strength rapid set grout and finished to match the existing structure. Slab jacking settled concrete curb and gutter poses an additional challenge, due to the minimal allowable surface area available to effect lift. GeoGrout utilizes custom designed mechanical devices to effect initial lift of these structures. Following the initial lift, the structure is raised to specified grade through the combined process of mechanical lift and pressure grouting techniques. This ensures that the entire void beneath the concrete curb and gutter is filled. The procedure is also applicable for lifting settled concrete drainage swales. 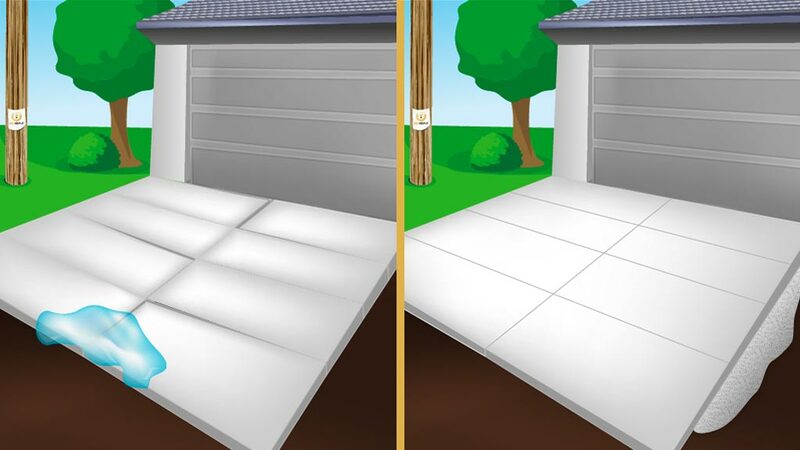 Lifting of settled residential concrete driveways require special attention due to the typical low flexural strengths associated with standard concrete and particularly exposed aggregate concrete driveways. GeoGrout utilizes a high flow grout mix, which minimizes point loading, hence eliminating or significantly reducing stress cracks during the lifting process. Pressure grouting is carried out at strategically placed injection points, to obtain uniform lift. Upon completion, core holes within standard concrete driveways are filled with a high strength rapid set grout and finished to match the existing structure. On exposed aggregate driveways, the existing cores are replaced and grouted to match the original surface. Conventional concrete restoration of settled concrete flatwork requires saw cutting, removal and disposal of the concrete, leveling the subgrade with a granular base, reforming and replacing the concrete flatwork. In addition, the adjacent landscaping and/or pavement requires rehab. This procedure normally takes several days to complete and is dependant on weather conditions. Alternatively a typical settled concrete section can be slab jacked in 20 to 40 minutes. In most cases the section can be returned to service upon completion. This significantly reduces any inconveniences to the site residence. Also there is little or no disturbance to adjacent structures or landscaping resulting in less environmental impact. Because of the reduced down time and little or no rehab to adjacent structures, slab jacking of settled concrete flatwork has proven to be an economical, viable alternative to removal and replacement. What happens to the core holes in my driveway? Initially, the 40 mm (1 ½ inch) diameter core holes are sealed with a foam plug. Within 2 – 7 days, each core hole will be filled with a high strength grout and finished to match the adjacent surface. The grout patch initially will appear darker in color, however, over time these areas will fade to the color of the driveway. On exposed aggregate driveways; each core is returned to its original location. These cores are set in place with a high strength grout, which is tinted to closely match the color of the existing driveway. We have just landscaped and placed sod around our sidewalk and driveway. Will the sod be damaged during the mudjacking? No, the process should not damage the sod. There are instances where the sod adjacent to the sidewalk edge may be disturbed; however, this generally happens when the soils are saturated. Therefore we suggest refraining from watering the sod a minimum of 1 day prior to mudjacking. Can concrete curbs and drainage swales be lifted effectively? Yes, however, due to the minimal surface area available to effect lift, we combine mechanical and mudjacking techniques to raise the structures to required grade. Will I have to move my vehicle and if so, how long do I stay off the sidewalk or driveway after the slab is mudjacked? The sidewalk or driveway area should be clear of vehicles when it is lifted. The mudjacking process will take approximately 20 – 40 minutes and in most cases, the sidewalk or driveway can be returned to service shortly after completion.